There was a time when turtlenecks were considered frumpy or unflattering, but now they are seen as a winter staple that can add an unexpected edge to your look. Instead of styling them with jeans, now wearing a turtleneck is all about clever layering tricks. You'll notice that most street style pictures from 2017 include a turtleneck. 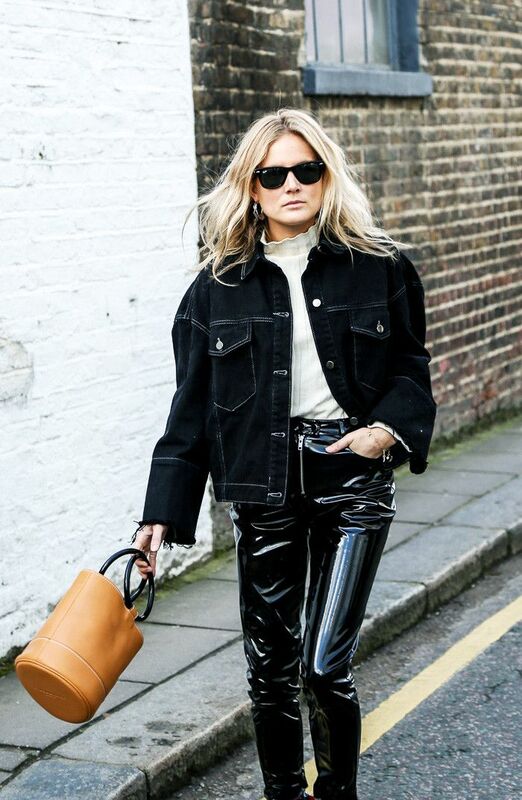 We've picked up a number of surprisingly cool ways to wear roll-necks from the street style set, including under ruffled shirts, blouses and summer dresses paired with jeans. While we believe everyone should own at least one black turtleneck, you can also experiment with textures and prints, whether that's a glittery hot-pink jumper or a striped roll-neck, as often worn by Susie Lau. Lucy Williams; PICTURED: Lucy Williams goes for a ruffled roll-neck, Topshop has them in a number of colours. And the number one secret to most street style outfits is a Uniqlo Heattech turtleneck worn as the base layer, meaning you can go coatless when it's still freezing. Scroll through the gallery below to see how to wear a turtleneck in 2017, and shop our edit of our favourite jumpers below. Style Notes: Placing a fine-knit turtleneck is how a true fashion expert layers. It's especially ideal if it's not quite cold enough for a big coat and you want to show off your whole outfit. Style Notes: There's nothing we love more than a bit of corduroy right now. Go for a brown roll-neck to wear under a full corduroy suit. Style Notes: An oversized knit over a skirt is our go-to winter outfit. Style Notes: In 2017, the number one layering trick has been wearing a dress over ankle-grazing jeans and a black roll-neck. Style Notes: Tine Andrea shows that a black roll-neck layered underneath a printed shirt or jumper adds an unexpected edge. Style Notes: Ruffled Victorian blouses were big news last year, and they look striking and forward when unbuttoned and layered over a black or white turtleneck. Style Notes: Turtlenecks have had an upgrade in 2017, and you'll find many adorned with ribbons, ties and fluted statement sleeves. Style Notes: Turtlenecks aren't just for jumpers, but chunky knitted roll-neck dresses such as Olivia Palermo's look chic (as well as being comfy). Style Notes: If you want to wear a floral, summery dress but either feel it's too formal for the day or it's not quite warm enough, follow Net-a-Porter's Lisa Aiken's lead, and wear it over a black knit. Style Notes: Every wardrobe should have a black, navy and grey roll-neck jumper—but Pandora Sykes shows that a zesty orange turtleneck adds something a little different when layering. Style Notes: Roberta Benteler shows that turtlenecks don't have to be practical basics, as at London Fashion Week, she wore a grey roll-neck with a circle at the waist with an interesting cutout. Style Notes: If you want to ditch your coat, a black turtleneck layered underneath two jackets will keep you toasty—as shown by Doina. Style Notes: An extra-chunky turtleneck such as Pernille Teisbaek's will mean you don't have to wear a coat—especially if you do the street style star trick of wearing a Uniqlo Heattech turtleneck underneath. Style Notes: If you want to wear a roll-neck under a white smart shirt, an expensive-looking styling trick is to completely unbutton the shirt, roll up the sleeves and wear it over an ivory jumper. Just be sure to avoid ketchup. Style Notes: When layering a slip dress over a roll-neck, it looks chic to keep the entire outfit in the same colour à la Camille Charrière. Style Notes: When layering a turtleneck underneath dresses and blouses, you don't have to always play it safe. Embrace unlikely print clashes like Susie Lau did in her striped jumper under a floral Vetements dress. A gorgeous blush colour, this will suit so many skin tones and be super flattering. A staple for your wardrobe over winter. Want to invest in one of the hottest streetwear brands around right now? Opt for Bella Hadid favourite, Off-White. Sometimes all you need is a black roll-neck. You can't go wrong with Uniqlo's offering. This one ties at the back. Opt for balloon sleeves to make a feature out of your roll-neck. The great thing about this is that although it's pricey, it comes in a grey that will be forever stylish.